Dress of black silk taffeta; belt of black silk taffeta with red and golden silk ribbons appliqué. A large bow at the back of the belt produces an effect similar to that of a Japanese kimono belt, and red, black, and gold coloring is reminiscent of Japanese lacquerware. 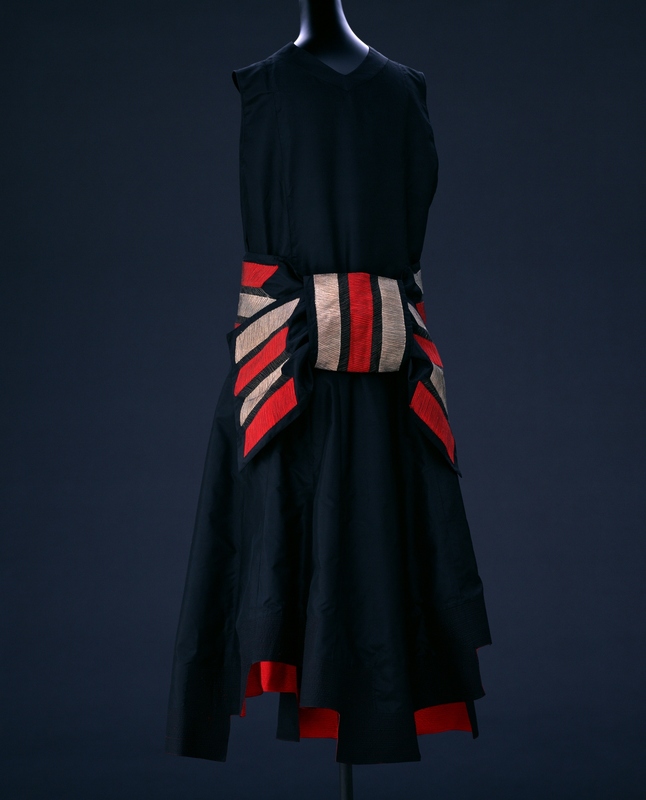 In the 1920s, European interest in exotic countries extended to include Russia, Egypt, South America, China, and Japan, and the couturière Lanvin embraced Japanese coloring and motifs in its creations. The hem of the dress is accented with regular variations of length, giving glimpses of red silk satin sewn inside the hem. The satin is covered in stitched geometric patterns. Lanvin began to use such stitching in the mid-1920s, when elegant decoration of ribbons or lace began to seem a little outdated. In the 1930s, this approach became one of the Maison's representative techniques. Placing the stitching on the underside was a very "modern" touch.